A NOTE ON THE PACKAGING: Because this tea is very special, a unique package was created for it exclusively. The outside of the substantial, gift-quality box is wrapped in a subtle off-white crepe texture and printed with the swallow and plum blossom motif. The lid wraps the front and has an invisible magnetic closure. Tea inside is held in a sealed foil pouch. Sourced directly from the warehouses of the former Menghai Tea Factory, this exquisite aged ripe Pu-erh was among the few authentic ripe Pu-erh made during the early years after ripe Pu-erh was invented. After 30 years of aging in Yunnan, time has done its magic to transform this tea into something special. Taste characteristics: Brewed to a bright ruby hue, this tea exhibits the characteristics unique to authentic vintage teas. Thick, smooth and full-bodied, this tea offers a rich Chinese herbal and antique wood scent followed by a lengthy sweet aftertaste that is satisfying and relaxing. 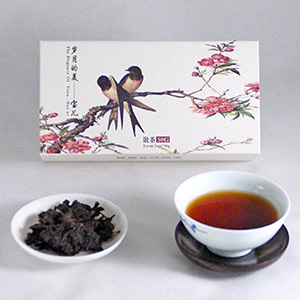 One of the ultimate goals of a Pu-erh connoisseur is to find a well-aged true vintage Pu-erh. Look no further, this tea is a must-have. Use 6g of leaves per 6 oz. of water. Quick rinse the leaves twice with boiling water before brewing.